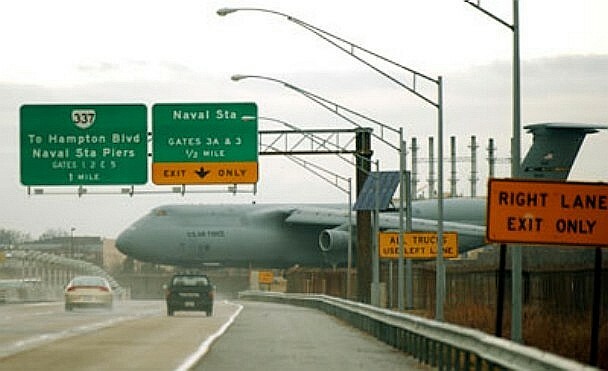 One of the military's largest transports was stuck on a runway atop the I-564 overpass for more than 16 hours last week, unable to turn around at the west end of Chambers Field at the Norfolk Naval Station. The incident, starting about 1 a.m., forced the closing of the field for most of the day to all but helicopter traffic and made for a dramatic sight to hundreds of motorists passing beneath it during the morning rush hour. "That thing's like a big building sitting there." said some motorists. The aircraft's nose was so far over the end of the ramp, the crew was unable to see the runway where it was supposed to turn around. The pilot stopped the aircraft and prevented it from running off the ramp. They also stated that it was too tight of a turn to turn the aircraft around. The Air Force C-5 Galaxy, largest airplane in the free world, is almost as long as a football field and as high as a six-story building. At 420 tons with a full load, it uses a system of 28 wheels to distribute its weight. The aircraft spent most of the day waiting for a specially made tow bar to be trucked to the base from Dover, Del. The tow bar arrived about noon and was used to hook the C-5 to a tractor so the aircraft could be turned around. The plane was moved off the runway by 4:30 p.m., No one was hurt, and the plane was not damaged.